Ali ibn Hussain (PBUH) (Arabic: علي بن الحسين‎) known as Zain al-Abidin (the adornment of the worshippers) and Sajjad (The Prostrating one), is the fourth Shia Imam, after his father Imam Hussain (PBUH), his uncle Imam Hassan Mojtaba (PBUH), and his grandfather Imam Ali (PBUH), the Prophet’s successor. He survived the Battle of Karbala because he was sick and he couldn’t fight. He was taken along with the enslaved women to Yazid in Damascus. Eventually, however, he was allowed to return to Medina where he led a secluded life with only a few intimate companions. Imam Sajjad’s life and statements were entirely devoted to asceticism and religious teachings mostly in the form of invocations and supplications. His famous supplications are well known as “Al-Sahifa Al-Sajjadiya”. Imam Sajjad (PBUH) was born in Medina, according to most sources in the year 659 A.D (5 Sha’ban 38 A.H). He may have been too small to have remembered his grandfather Imam Ali (PBUH), but was brought up in the presence of his uncle Imam Hassan (PBUH) and his father Imam Hussain (PBUH), the Prophet’s grandchildren. He was related through his mother Shahrbanu, the daughter of Yazdegerd, to the last Sassanian King of Persia (Iran). Thus he was said to be Ibn Al-Khiyaratayn, the “son of the best two (the Quraysh among the Arabs and the Persians among the non-Arabs)”. According to some accounts, his mother was brought as a captive to Medina during the caliphate of Omar, who wanted to sell her. Imam Ali (PBUH) suggested instead that she be offered her choice of the Muslim men as husband and that her dower be paid from the public treasury. Omar agreed and she chose Imam Ali’s son, Hussain (PBUH). In 680 A.D, Imam Hussain (PBUH) and all male followers were massacred by the forces of the Umayyad caliph Yazid at the Battle of Karbala. Imam Sajjad (PBUH) accompanied his father on the march toward Kufa and was present at the Battle of Karbala, but survived the battle due to his illness. Once the Umayyad troops had mass murdered Imam Hussain (PBUH) and his followers, they looted the tents and took the skin upon which Imam Sajjad (PBUH) was laying. It is said that Shemr was about to kill Sajjad (PBUH), but his aunt Lady Zaynab (PBUH) was present to make Omar Ibn Sa’ad, the Umayyad commander, let him alive. Imam Sajjad (PBUH) was taken along with the enslaved women to the caliph, and eventually was allowed to return to Medina. During this journey he delivered speeches in the towns of Kufa and Damascus, and informed the people of his father’s intentions. 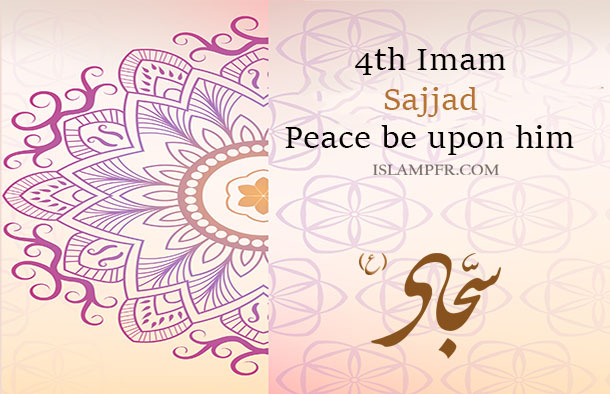 Imam Sajjad (PBUH) had been designated by the order of God, as the next Imam. However, Muhammad Ibn Hanafiyah (Imam Hussain’s half-brother) said that he was more worthy as leader of Muslims because he was the son of Imam Ali (PBUH). But Imam Sajjad (PBUH) replied to his uncle: “Fear Allah and make no such claim”. After the death of Ibn zubayr, the governor of Medina, Imam Sajjad (PBUH) and Muhammad Ibn Hanafiyah agreed to go to Mecca and appeal to Black Stone (a stone from heaven that was put in Kaba wall by the prophet Abraham) to see if they could determine which one of them was the true successor. They went to Kaba where black stone was placed. Muhammad prayed for a sign but no answer came. Afterwards Sajjad (PBUH) prayed and this time the stone became so agitated that it nearly fell off the wall and came the answer in eloquent Arabic that he was the true Imam after Imam Hussain (PBUH), to which decision Muhammad consented. After this settlement Imam Sajjad (PBUH) returned to Medina with his companions. Imam Sajjad (PBUH) was held in great respect not only by Shia Muslims, but also by the learned circle of Medina scholars who considered him as an eminent traditionist. The famous lawyer, Ibn Al-Musayyib, and the great jurist and traditionist Al-Zuhri (though attached to the court of the Umayyad), were among his admirers. Perhaps the most famous evidence for his high position among people is the ode that the well-known Arab poet “Farazdaq”. This ode refers to the occasion where the Caliph Hisham Ibn Abd Al-Malik was overshadowed by the respect people showed to the Imam. It was the time of Hajj when both of them were trying to reach the Black Stone through the crowd turning around the Kaba. The people gave way to Imam Sajjad (PBUH) while Hisham struggled desperately. This deeply offended the Caliph, and sarcastically asked who the person had been to whom the people had shown such respect. Farazdaq, who was present there, thereupon composed an ode addressing Hisham’s question; an ode which is a masterpiece of Arabic literature; and that must be considered as the most reliable contemporary document describing Imam Sajjad (PBUH). However, As the Imam was self-denying and turned away from the world, the Sufis considered him as one of their kind and wrote biographies about him. However the Imam led a life different from that of the Sufis as his asceticism was internal and psychological and internal rather than otherwise. It is narrated from the Imam that while circumambulating the Kaba, he heard a man asking Allah for patience, so he turned to him and said: “You are asking (Allah) for tribulation. Say: O Allah, I ask you for well-being and gratitude for it.” It is also related that a person questioned the Imam about asceticism, he replied: “Asceticism is often degrees: The highest degree of asceticism is the lowest degree of piety. The highest degree of piety is the lowest degree of certainty. The highest degree of certainty is the lowest degree of satisfaction”. The “Al-Sahifa al-Sajjadiya” is the oldest prayer manual in Islamic sources. Shia consider this book with great respect, ranking it behind only the Quran and Imam Ali’s Nahj Al-Balagha. This prayer book deals not only with Islamic spirituality, but also provides teachings on different levels, from the theological to the social. The Imam also refers frequently to the domain of Islamic practices emphasizing the necessity of following Quran and the Hadith’s guidelines and the necessity of establishing justice in society. The Fifteen Whispered Prayers also known as The Fifteen “Munajat”, is a collection of fifteen prayers attributed to Imam Sajjad (PBUH) which some researchers regard it as a supplementary part of the latter collection. These Prayers enable a person to recite the prayer which is in most accordance with his present mood and feeling. The prayers start with ‘repentance’, as repentance is the first step towards a genuine communion with Allah. Abu Hamza Al-Thumali has related that during the month of Ramazan, Imam Sajjad (PBUH) used to spend a greater part of the night in prayers and when it used to be the time of beginning of the fast he recited a supplication which later known as “Du’a Abi Hamzah Al-Thumali” (The supplication of Abi Hamzah al-Thumali). This supplication has been recorded in the book Misbah Al-Mutahijjid of Shaykh Tusi. Imam Sajjad’s “Risalah Al-Huquq “(Treatise on Rights) is written by him besides supplications or relatively short sayings and letters. Huquq (Arabic: حقوق‎) is plural of “Haq” (Right) and is best translated as “rights”. However, other words such as justice, truth, obligations, duties, responsibilities have meanings closely related to Haq. This treatise is especially important for the manner in which it deals with many of the same themes as the Al-Sahifa in a different style and language. As the Imam makes eminently clear in this book, a hierarchy of priorities must always be observed: The individual comes before the social, the spiritual before the practical, and knowledge before action. Each human being has a long series of social duties, but these depend upon his more essential duties, which are first, faith in Allah, and second, placing one’s own person into the proper relationship with the Divine Reality. Imam Sajjad (PBUH) martyred in 713 A.D (25 Muharram 95 A.H) in the age 57. After cruel behaviors of Umayyad caliphate to Imam Sajjad (PBUH), finally he was poisoned by Umayyad ruler Walid through the instigation of the Umayyad caliph Hisham Ibn Abd Al-Malik in Medina. 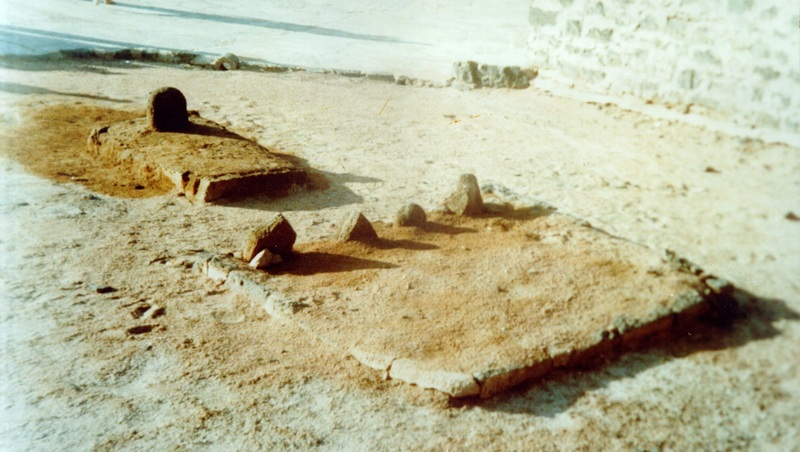 He was buried next to his uncle, Imam Hassan Mojtaba (PBUH), in the cemetery of Baqi in Medina. After his Martyrdom many people found out that their livelihood had come from him. He would go out with a sack of food on his back, knocking at the doors of more than 100 families, and gave freely to whoever answered while covering his face in order not to be recognized. It is narrated, Imam Sajjad had a camle that never had been hit by Imam. After Imam’s martyrdom, the camel ran to his grave, laid down on the grave and began to cry. Imam Sajjad’s son, Muhammad Baqir (PBUH) who was next Imam, found the camel and asked it for calm. The camel returned home, but tomorrow he ran to the grave again and Imam Baqir (PBUH) brought it back home. For the third time, Imam Baqir (PBUH) said to the others: “Leave it alone. It knows that it will die soon”. Less than 3 days, the camel died beside the grave. The shrine containing Imam Sajjad’s tomb was destroyed in 1925 during the conquest of Medina by Al-Saud tribes (Wahhabi). This was part of a general destruction of memorials in cemeteries for beliefs. In the eyes of Wahhabis, historical sites and shrines encourage “shirk” (the sin of idolatry or polytheism) and should be destroyed but it’s against Islam’s view. It’s provable that keeping these memorials and pilgrimage isn’t Shirk. Wahhabi government of Saudi Arabia, don’t let the pilgrims to get close to the graves. They even don’t let Shia people make a Shrine there.